I know a good chunk of you were indifferent at best about Ohio State's NCAA Tournament chances, but I know one group of people pretty stoked the Buckeyes are dancing. I'm not going to pretend to really believe the Buckeyes are going to make a deep shot in the NCAA Tournament, but they're there. And that's way better than not making it from a morale standpoint. And hey, it's March. Who the hell knows? The Buckeyes are going dancing. Five things to know about Iowa State. Buckeye nerves turned into excitement with announcement. Ohio State opens as 6.5-point underdogs to Iowa State. Rating Ryan Day's nine units this spring. Sean Nuernberger is still kicking and has "two plan As." Ohio State could be looking to add a graduate transfer center. The very odd football coaching hotbed that brought us Ryan Day. Fans may have wanted Archie Miller, but Chris Holtmann has been better. Ohio State is looking to sign two top-10 running backs this recruiting class. Men's hockey team bounced from the Big Ten Tournament. Word of the Day: Scintilla. NO HASKINS IN NEW YORK? We've all been assuming since the Rose Bowl that one way or another, Dwayne Haskins would be a New York Giant next year. Pretty much every mock draft for the past three months – maybe even longer – has had Haskins going to the Giants with the No. 6 overall pick. It turns out, everyone may have been completely wrong from the start because according to ESPN host and anchor Dianna Russini, the Giants aren't even interested in Haskins. “The only information I have right now is they’re not in on Haskins,” Russini said. “Just the amount of work they are not doing on him tells me they are not that into it." If I were a Giants fan, I'd be walking straight into the ocean with bricks glued to my feet, because between this decision and signing Golden Tate to a $37.5 million deal immediately after trading away Odell Beckham Jr. for a bad safety and draft picks, I have absolutely no idea what the franchise is doing anymore. At this point, I fully expect them to use their newly acquired picks to do something like trade up and select Daniel Jones. That would be too perfect. New York's incompetence aside, Haskins still needs a home. If it's not going to be the Giants, you have to go a long way before you get to another team in need of a quarterback. The Broncos could take him at No. 10, even though they just signed Joe Flacco. There's also a chance Bengals or Packers could take him at No. 11 or No. 12, if he really is still around. If he really slips that far, Miami could snag him at No. 13 even after signing the Fitzmagic short-term bandaid. 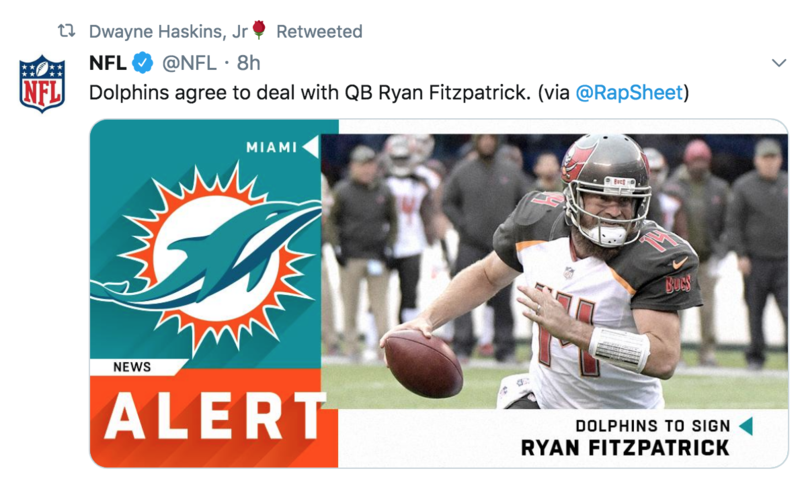 You can read into this Haskins retweet as much as you want. The most likely scenario is that some team – even one of the four I just listed – would trade up to somewhere in the top-10 to make sure they get him, because that's just what you do with quarterbacks in the draft. There's a good chance we won't know how that's going to shake out until draft day, so buckle up. It could be a wild ride. LEAST LIKELY TO REPEAT? Hey, here's something that had Buckeye fans riled up on a Friday. Tom Fornelli at CBS Sports does a weekly piece called "Friday Five" where he essentially just ranks five college football things. This week, he ranked the top-five teams least likely to repeat as divisional winners. Ohio State made his list, at No. 5. I personally believe the Buckeyes are going to win the Big Ten East, but I also don't think this is an egregious, vile take that deserves torches and pitchforks. In defense of Tom Fornelli, who I think is a very good college football analyst, this opinion is more than fine. For starters, he's not saying Ohio State is unlikely to win its division, or even that he doesn't think they will, just that the Buckeyes are less likely than five other teams, since there are only 10 possible teams to make this list. When you look at the other five teams, there's no good reason for Alabama and Clemson to be on this list, and both Georgia and Oklahoma are very strong teams in relatively inconsistent divisions. The only one left is Washington, and while I disagree, believing Washington is more likely to win its division than Ohio State is not something I'm going to crucify you for. (weird aside: both Washington and Ohio State will start former UGA five-star quarterbacks this season). Second, it's generally a fine opinion to believe that a team with a first-year head coach and a first-year starter at quarterback are less likely to be successful than teams with proven head coaches and proven quarterbacks, especially if you have no affiliation to the team you hold that opinion about. The one issue I have is that he compared this situation to 2011, but at the same time, I also don't think he actually expects it to be anything close to similar. He just tossed out a recent cautionary tale about how things can go from great to bad quite quickly. Outside looking in from a national perspective, this is a reasonable opinion to have. It's also just extremely offseason offseason content mostly designed to get people talking. It worked! CHRIS HOLTMANN GETS PAID. After getting a team that had no business making the NCAA Tournament into the Big Dance, Chris Holtmann is collecting a well-earned bonus. There are sometimes I admittedly doubt whether or not a coach actually did enough to earn a bonus like this, but I'm giving Holtmann all the props in the world here. Getting this team to the NCAA Tournament was always going to be a steep hill to climb, but then he had to deal with Micah Potter quitting the team less than a week before the season started, an injury to C.J. Jackson for what turned out to be a close game, and the suspension of his top scorer and rebounder during the last three games of the regular season. He's been a miracle worker the past two seasons. I can't wait to see what he does next year with a good chunk of this year's roster returning with the addition of three top-50 players and a transfer guard who played significant minutes for an Elite 8 team (people forget about C.J. Walker). THAD BACK? It's looking like there's a strong chance Thad Matta is coming back to the college hoops coaching ranks, provided, of course, that he wants to. If he does, it's just a matter of where. The top candidates are currently looking like UNLV and UCLA. Thad to UNLV seems to be generating the most chatter on Twitter with some folks suggesting that it's a done deal. But UCLA needs a coach too, and if I were a coach weighing my options between UCLA and UNLV, I think I'd be tossing on the blue and gold pretty quick. If and when UCLA’s search moves on to college coaches, I was told by a well-placed source that there is legitimate interest in giving Thad Matta a long, hard look. Matta is a proven winner, and he fits the UCLA image. When Matta was fired from Ohio State in June 2017, the school cited health concerns, but I never bought into that. Matta suffers from dropped foot as a result of a back surgery gone awry, but that never kept him from doing his job. His problem at Ohio State was that he brought in too many players of questionable character, and the roster turnover killed the program. The health issue looked like a convenient excuse that enabled everyone to save face. I’m told Matta’s health would not be an impediment. Although he interviewed last year at Ole Miss and Georgia, he might have just been satisfying a clause in his Ohio State contract that requires him to look for employment in order to keep getting his buyout money. In the end, Matta turned those jobs down, saying he didn’t want to uproot his daughter before her senior year of high school. Matta has been laying low during his hiatus, telling friends how much he is enjoying life and how grateful he is to be out of the cesspool of college basketball recruiting. But he still has the coaching bug, and an offer from UCLA would be mighty enticing. Again, all of this is obviously going to come down to what Matta wants. I don't believe Matta's separation from Ohio State was totally or even primarily due to health concerns either, but I do think they at least played a factor. And given the stories I've heard since his retirement, I know how much he despised the filth of college basketball recruiting. I don't know if he'd be ready to hop back in, but if he does, I'll be a fan. MUST-HAVE AUTOGRAPH. It's kind of hilarious that Anthony Schlegel's most famous Buckeye moment came about a decade after his playing career, but I don't think anybody is mad about it, especially Mike Doss, who appears to have collected what might be the best autographed photograph in Ohio State football history. Honestly, it's a poor business decision on Schlegel's part not to do a local mall tour signing those photos. You best believe I'd be in line.